Blue Ruin knocked me out. This was easily my favorite film of 2014 (yes I know IMDB lists the release as 2013 but its theatrical run was in April of 2014.) I can't speak highly enough of this film. If I'm perfectly honest with myself... the main reason I'm compiling this list is to mention this film again. I don't really have anything new to add but you can find my full review here. Sandra (Cotillard) has come out of the hospital to some very unwelcome news, during her stay in the hospital she has been fired. The infinitely wise and spineless management decides, the only way Sandra can hope to stay employed at the factory is to convince her co-workers to give up their much-needed yearly bonuses. Now, over the course of one weekend, Sandra must confront each co-worker individually in order to win a majority of their votes before time runs out. 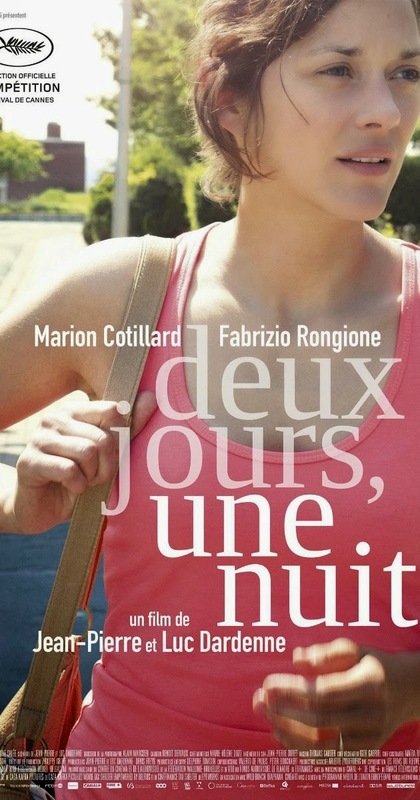 The insanely versatile Marion Cotillard gives a near career best performance as Sandra in Jean-Pierre Dardenne and Luc Dardenne's TWO DAYS ONE NIGHT. This is a perfect example of minimalist storytelling allowing for performance and emotion to take center stage. The brilliance of Ti West is how slowly he ratchets up the tension. How he sprinkles in little touches that create an increasing sense of anxiety. The film never slows down to let you catch up or breathe, it just slowly builds on itself until it has become complete chaos. Even though I had a good idea of exactly where this film was taking me, it was still a powerful and draining experience. The roller coaster analogy is completely over used but that is the first thing that comes to mind when I try to explain this movie. Not really the experience of watching the movie but having fore knowledge of what might happen. When you stand in line at an amusement park and watch the ride, when you hear people screaming at the same places over and over you think you have an idea of what the ride will be like. But, you are not prepared for the the ride at all. In fact having an idea of where it's going has built in more anticipation and added to the thrill of getting in that seat and giving yourself over to the experience. Sorry about the hacky analogy but I just want to assure you that having an idea of where this film is leading you will not prepare you for the experience of witnessing it. Writing this and thinking about the events of the film has given me sweaty palms and an ill at ease feeling all over again. 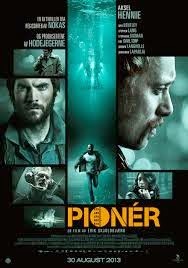 Set in the early 1980's Pioneer tells the story of a deep sea diver. In looking over a list of films that focus on deep sea diving one thing became almost instantly clear, there have not been a great number of quality films made about deep sea divers. I found this surprising considering the claustrophobic nature of diving and inherent beauty of the ocean lends itself wonderfully to film. To make a thriller in this setting would be a challenge but after seeing this film I can say that it was a challenge worth taking. You can see my full review here. We've all heard of Herb Brooks and the 1980 "miracle" at the Lake Placid Olympic games but if you are like me you probably never considered the other side of the story, the Soviet side. 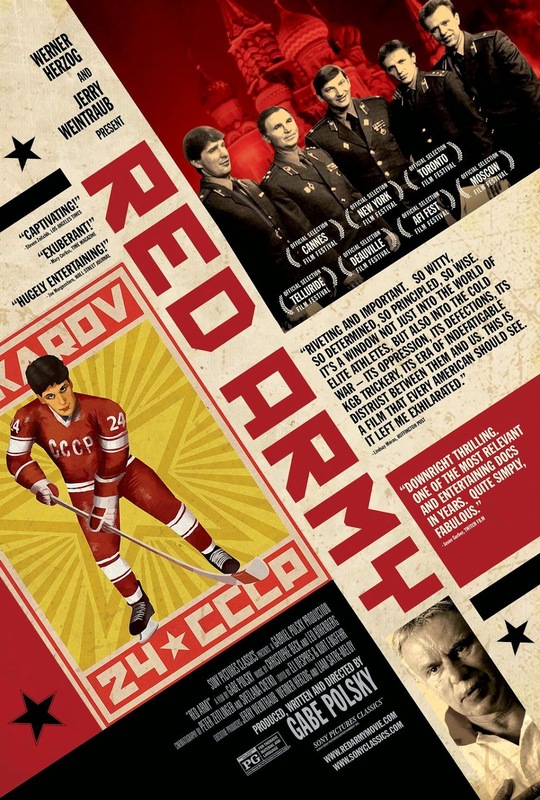 RED ARMY is on a macro-level a story about the Soviet Union but specifically its the story of the "most successful dynasty in sports history: the Red Army hockey team." The best documentaries are the ones that can open us up to new stories or give the viewer a fresh perspective on a familiar one. This is not a film made for sports fans alone. Director Gabe Polsky tells a deeply human story and paints an emphatic portrait of these once American adversaries. The son of first generation Russian immigrants Polsky said he was "provided an opportunity both to explore my heritage and to examine the impact hockey had on the culture, politics and legacy of the Soviet Union." Kevin Smith has made something truly unique with Tusk. This is a film that requires over 200 hours of preparation to fully appreciate and possibly enjoy. The film was spawned from a conversation on Smith's hugely popular podcast and is filled with nods and references to that show. As someone who has listened to every episode of the podcast I enjoyed those nods and felt like this was a film made for a very specific group of people, a group that I am proudly a part of. I have no doubt in my mind that this is the exact film Smith wanted to make, this one didn't get any studio notes. Dan Harmon (the creator of Community) hosts a weekly podcast at Nerdmelt Comics in Los Angeles. Harmontown is ostensibly about Dan Harmon taking his podcast on tour after he was fired from Community but the real story is that of the shows dungeon master Spencer. He is simultaneously the voice of the audience and the voice from the stage. A misfit who wanted nothing more than to play D&D with one of his heroes. Harmon is one of the most honest performers I've seen. His material seems to come from a place of both self hatred and adulation, an insecure ego maniac who is self aware enough to realize his greatest struggle is to come to terms with the fact that he got everything he wanted. He is a brilliant writer who is known for his anger and public outbursts but if you look at the people he surrounds himself with and the shows he has created you get a much fuller picture of the man. A sensitive man whose feels the pain of the world around him while trying to find a place that he can call his own. This is a documentary film about the use music therapy with elderly nursing home patients. Apparently when the patients who are other wise borderline catatonic hear music from their youth they open up, talk, dance and sing. The film follows one man who wants to implement music therapy programs in all 1600 nursing homes in the United States. Clearly he has a lofty goal but one that could be achieved. Its difficult to separate a documentary films subjects from its makers but I feel like you must do it with Alive Inside. The subject matter is heart warming, saddening, frustrating and strikingly urgent but the heavy handed approach of the filmmakers is distracting and shows a lack of faith in his subject. With that being said the subject is powerful enough to transcend its execution. When you are discussing dementia and alzheimer's have faith the viewer can understand you're point without having trippy slow-motion shots of grandma looking confused and scared. These moments are minimal but they do a disservice to the overall quality of the film and undercut its important message. These are the immediate films that came to mind when I began writing two hours ago. Its in no way a complete list but these are the films that I feel may have been lost in the shuffle in 2014.